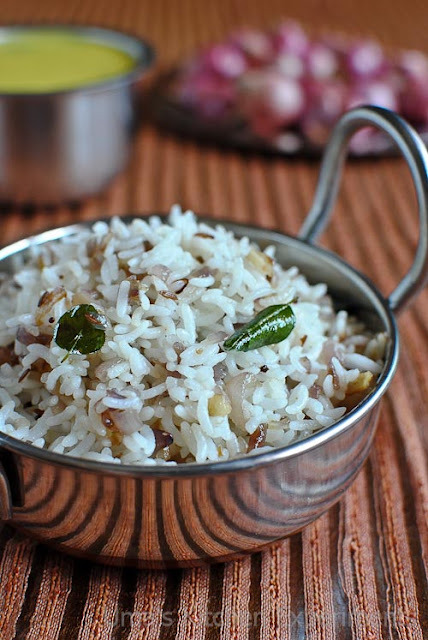 When I need to cook only for myself, I prefer simple, easy mixed or variety rice as it doesn't require any side dish and can finish the food with papad. Sometimes I go for preparing pasta. When I checked my pantry, I saw only a small quantity of penne pasta. So, I kept rice in a pressure cooker. Meanwhile, chopped onion for making this quick onion rice. My grandma makes this rice if someone at home feels sick of stomach pain or diarrhea and also to ease the digestion and cool the body. She slightly mashes the rice using spatula and adds it with the sauteed onion. 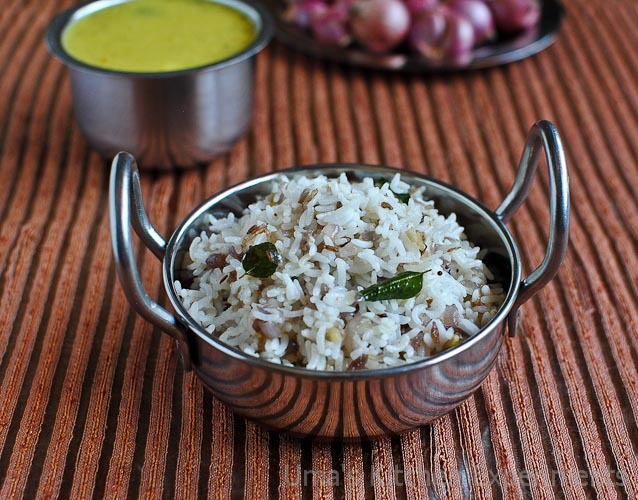 But I am a great fan it, I prepare it often without mashing and sometimes enjoy it with a dollop of ghee. 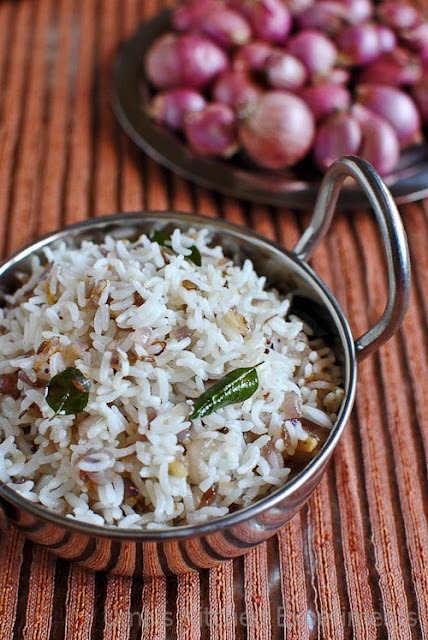 Use only small onions for preparing this rice. I tried it once with red onions but I find there was a change in taste. 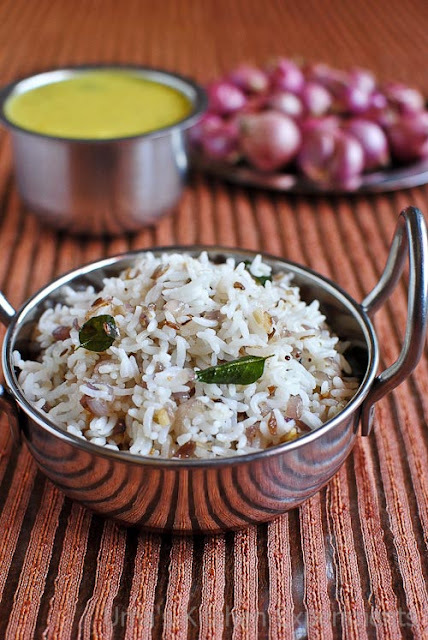 Also, make sure to use only gingelly oil (sesame oil) for preparing this rice. It tastes good only when it is prepared with hot steamed rice. 1) Heat oil in a frying pan or kadai. When it is hot and not smoking, add mustard seeds, cumin seeds and curry leaves. Allow it to splutter. 2) Add chopped onion and garlic. Saute for second. 3) Add a pinch of salt. This helps onion to cook quickly. 4) Saute continuously till the onion turns soft and slightly brown. 5) Reduce the flame and add cooked rice. Gently mix well. Taste and adjust the salt. 6) Cook till the rice heats up well. 1) Use only small onions for perfect taste. Addition of mustard seeds, cumin seeds and garlic are optional. You can directly fry the onion in oil and mix it with rice. 2) Those who want spicy taste, add 2 slit green chillies while seasoning or you can add black pepper powder. 3) Do not use left over rice. 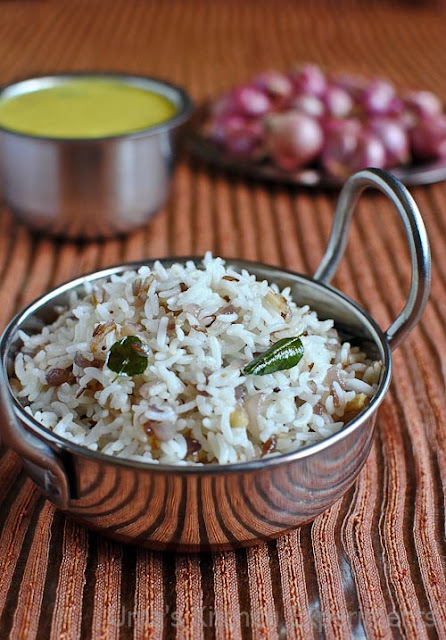 Absolutely delicious onion rice. Yummy. Nice clicks dear. Its my fav one so delicious anytime. Unique and healthy rice,can imagine the flavor. looks delicious and nice pics..